The highest officials and leaders of political parties in Republika Srpska seek from the Constitutional Court of BiH to annul a decision challenging certain provisions of the Law on Republika Srpska Day defining January 9 as the day of holiday celebration, in a joint statement, which they unanimously adopted yesterday in a meeting in Banjaluka. “The BiH Constitutional Court’s decision dated March 29, declaring certain provisions of the Law on Republika Srpska Day incompatible with the Constitution of BiH, is a political act aimed at negating the legality and legitimacy of Srpska and constitutional-legal order of BiH established by the Dayton Peace Agreement. The BiH Constitutional Court’s decision is attempted revision of historical events and the inconstant fact that Srpska was established on January 9, 1992, therefore we are asking the Constitutional Court of BiH to annul that decision,” the statement reads. In a statement adopted at the meeting of Republika Srpska President Željka Cvijanović with representatives of Srpska-based parliamentary political parties, single position was taken that the Republika Srpska will continue to celebrate the Republika Srpska Day on January 9. The text quotes part of the decision passed by the Constitutional Court of BiH, which annuls provision on January 9 as the Republika Srpska Day, noting that “it does not challenge, exclude or limit the competence of the Republika Srpska National Assembly to call a referendum on a date of Republic Day celebration”. “With such a strange, unreasonable and ambidextrous position, the Constitutional Court of BiH ignores the fact that a referendum on this topic was already held on September 25, 2016, where the people’s will to mark 9 January as the Republika Srpska Day was voiced. Such Constitutional Court’s decision attacks the will democratically expressed in the referendum, which is completely inadmissible in the modern world. Such a decision proves that neither Srpska nor Serb people, based on whose will it was created, are being respected in BiH,” the statement reads. 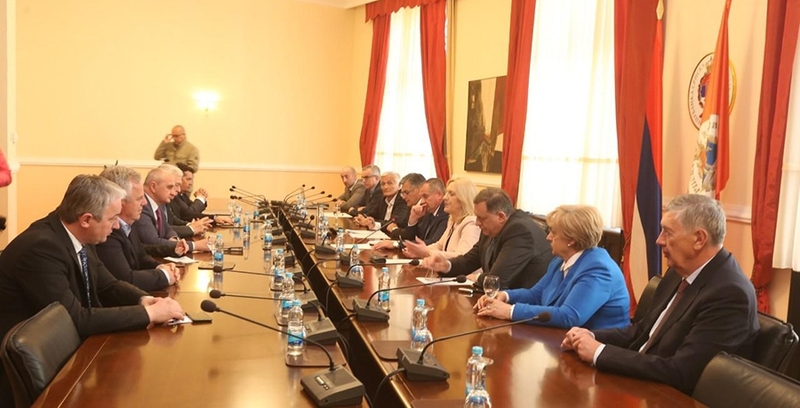 The participants of the meeting stressed that the Declaration issued by the National Assembly dated April 17, 2015, regarding the motion for reviewing the constitutionality of the Law on Republika Srpska Holidays before the Constitutional Court of BiH, remains obligatory. “The activities of Srpska and its representatives in BiH will depend on the anti-constitutional activities directed against Republika Srpska, therefore we expect support for preventing the violations of the Dayton Accord, which can cause serious consequences for the hard-established peace and stability in BiH,” the statement reads. Republika Srpska President Željka Cvijanović, Chairman of the BiH Presidency Milorad Dodik, National Assembly Speaker Nedeljko Čubrilović, Prime Minister Radovan Višković, Chair of the Council of Peoples Nada Tešanović, and the members of the collegiums of the House of Representatives and the House of Peoples of the Parliamentary Assembly of BiH, Nebojša Radmanović and Nikola Špirić, signed the joint statement. Ledares of the SNSD Milorad Dodik, DNS Marko Pavić, PDP Branislav Borenović, SP Petar Đokić, United Srpska Party Nenad Stevandić and NDP Dragan Čavić, and deputy leaders of the SDS Miladin Stanić and DEMOS Spomenka Stevanović also signed the statement. During the adoption of the statement, they emphasized that they are committed to permanently protect the legal position of Srpska as direct signatory of all annexes to the Dayton Agreement, which, with the preamble to that document, gives it the status of the contracting party to the peace agreement. They emphasized that they respect the inalienable right of Serbs to independently perform constitutional, legislative, executive and judicial functions, taking into account the Declaration of the Republic of Serb People of Bosnia and Herzegovina dated January 9, 1992 and its importance for the sovereignty and identity of Srpska as well as the expressed commitment to guaranteeing full equality of peoples and citizens before the law and protection against any form of discrimination. Officials and political party leaders stated that the decisions of the Constitutional Court of BiH dated March 29, 2019 and November 26, 2015 caused adverse consequences for peace, stability and trust in BiH. They reminded that the Republika Srpska Day – January 9 is the legal holiday of Srpska confirmed by the submission of the Venice Commission dated October 14, 2013, which was made at the request of the Constitutional Court of BiH, thus called upon the universal right of the people to express their collective will through a referendum. The Constitutional Court of BiH defined on Friday, March 29, that the provision of the Law on the Republika Srpska establishing January 9 as the Republic Day, is not in accordance with the Constitution of BiH, emphasizing that this does not question the existence of the Republika Srpska Day itself.